Are you interested in an easy way to take part of your income, invest it, and have tens of thousands of (dollars or more in the future? Do you think you need to be super smart, sophisticated and educated to be a successful investor? What if I told you that I know plenty of people who are in the second half of their lives now, never had particularly high paying jobs, lived quite well, with homes of their own, nice cars, annual vacations-who have high 6 figure (and more) investment portfolios. One of the advantages of advancing age, is experiencing the results of your former behaviors. When my face was broken out with acne as a teen, my mom said, “You’ll appreciate your oily skin later in life, because you’ll have fewer wrinkles”. And she was right! I wanted to invest in my 20’s and so I started buying stock mutual funds and bonds. My job at San Diego State University in my 20’s offered a 403(b) (U.S. non-profit employee retirement plan), so I jumped in. I wasn’t thinking much about compounding returns or how much money I needed in retirement. My interest was to build up some financial security for the future. My future goals were vague at best. Flash forward many decades and I’m pleasantly surprised at how a habit of saving in retirement plans, and investing extra money, has actually turned into an investment portfolio which I can live on. Are You Interested in Learning How to Invest-Without Sacrificing Everything Now? Before you dive into investing, there are a few steps to take first. You need to get rid of most of your credit card debt. If you have kids or someone depending on your income, then you need some term life insurance. Finally, build up an emergency fund in cash of 6 to 9 months, after all – sh*t happens. Next, it’s helpful to work on your career and building a decent income. For most, this takes some time. But it’s important to have a solid income trajectory to minimize financial stress. Learning to invest-like anything of value worth knowing- cannot be learned in an hour or two. But, with a good book or two and some time to implement the investing recommendations, you can set yourself up with a sensible investing strategy that won’t take too much time to implement and will likely net you long term financial security. It can be quite overwhelming to look at all the investing gurus and resources out there. As Barry Schwartz discussed in The Paradox of Choice, sometimes more choices are actually worse than fewer options. It is with that inspiration that I wrote Invest and Beat the Pros-Create and Manage a Successful Investment Portfolio. (on sale for $.99 from now until February 8th and free from February 9 through the 14th). What Is the Investing Strategy That Beats the Pros? beating the market. They’re just not going to do it. 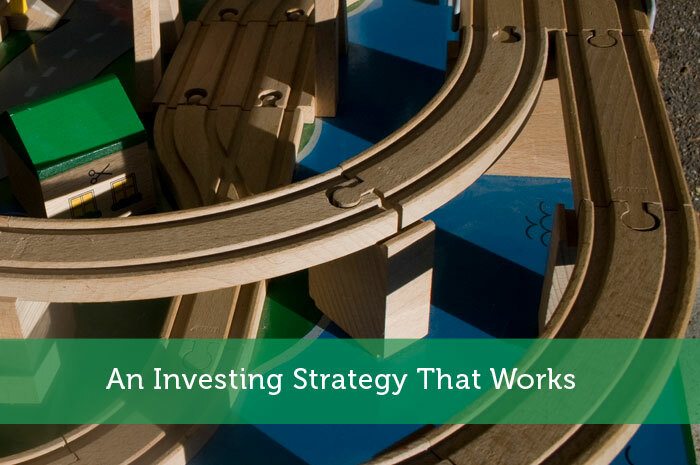 What is the Investing Strategy That Works? Realistically, there are only a few steps to choosing an investing strategy. Figure out your risk tolerance. In other words, how much up and down in your portfolio value can you stomach? Set up an automatic debit from your paycheck or other income source into an investment and/or retirement account. Based upon how much risk you can stomach, you’ll choose the percent of your investment money that will go towards stock mutual funds and the percent invested in bond funds. (The more conservative you are, the lower the percent of stock investments you’ll choose). Pick several low cost mutual funds for your investment portfolio and as your money comes in to the investment account, allocate it into the previously chosen percentages to purchase shares in the mutual funds. That’s about all. Once a year you can review and rebalance back to your original percentages. Sounds fairly clear cut doesn’t it? For a bit more detail on setting up your investment portfolio, check out Invest and Beat the Pros-Create and Manage a Successful Investment Portfolio. 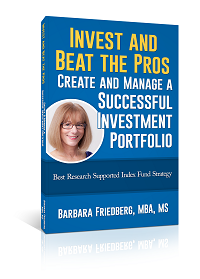 Barbara Friedberg, MBA, MS is a veteran portfolio manager, expert investor, and former university finance instructor. She is editor of Personal Finance; An Encyclopedia of Modern Money Management, How to Get Rich Without Winning the Lottery, Invest and Beat the Pros-Create and Manage a Successful Investment Portfolio and publisher of Barbara Friedberg Personal Finance.com. Find her “Young & Oldish Money” podcast on iTunes. Nice seeing Barbara here, too. I already ‘stalk’ you on your own blog. Love the article and this wealth of information you shared with us. Worth bookmarking and studying patiently. Dojo, Stalk away. If stalking leads to investing…. then I’m all for it. Glad you liked the article. This a sweet article Barbara how much of an initial invest is needed to invest with the managers who beat the indexes? You also mentioned picking stocks for ourselves and beating them that way. How would one know which stocks to pick to meet that objective? I’m a big fan of index investing. I believe in the semi-strong efficient market theory. Only the top (~5%) professionals can beat the market and they help ensure prices remain fair/balanced. So I prefer to buy index funds and follow a value averaging investment approach where asset classes get rebalanced every 4 months. Right now we’re 60/40 stocks bonds due to the record level of the markets. A few years ago it was 80/20. That’s the cool thing about the value averaging strategy, you mix changes up/down over time depending on how markets perform vs expectations. My whole net worth strategy is based on a similar investment philosophy – buying “beta” at the cheapest price. I simply set an asset allocation guideline, then implement using ETFs. Thanks for sharing your approach. ETFs can be a great vehicle for investing as long as you don’t end up overpaying in commissions. @James, Actually, to beat the pros, all you need to do is set up an investment portfolio in diversified index funds and contribute through thick and thin. Actually, Iinvest and Beat the Pros will be on a FREE promotion from Feb 8-13th, so why not pick up a copy from Amazon kindle? @Thomas, Although that’s a bit more rebalancing than I suggest, I certainly agree with attending to overall market valuations and tilting your asset allocation depending upon that data. Although that approach is a bit more than the average investor may be up for, or needs to do.